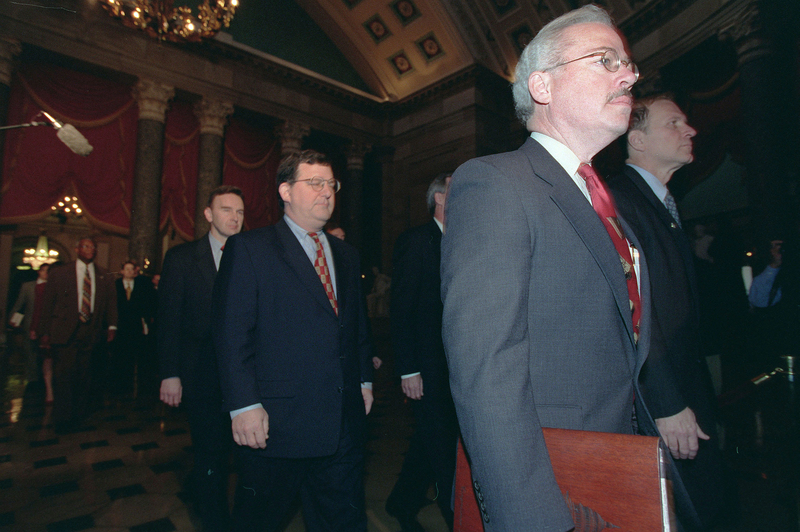 An active participant in presidential contests dating back to the Johnson administration, former Rep. Bob Barr is closely monitoring everything elected officials are up to — and perhaps slacking on — during this rollercoaster ride of a nomination run. The Georgia Republican in 1997 worked hard to force then-President Bill Clinton from the Oval Office, leading the charge on impeachment proceedings that cleared the GOP-led House only to fizzle in the Senate. A decade later he mounted an unsuccessful run for the White House on the Libertarian ticket. This time around, the four-term lawmaker is staying mostly on the sidelines. But the famously outspoken pol had no problem taking unimaginative political operatives to task for allowing current GOP front-runner Donald Trump to spin his way to the White House. Barr’s history with White House hopeful Hillary Clinton runs deep. Barr introduced legislation designed to cut short her husband’s second term, helped draft the articles of impeachment reported out by the House Judiciary Committee and presented the House’s case before the Senate — a concerted effort he is still supremely proud of. While the populist wave that Sen. Bernie Sanders, I-Vt., has caught on the other side of the ideological spectrum may have taken Team Clinton by surprise, Barr insists the ascent of Trump has been a long time coming. “The rise of Donald Trump can be explained in many respects as the sort of ‘Rosemary’s Baby’ of the Republican Party,” he said of the media mogul’s hostile takeover of the GOP. Barr said Republicans have for years been “coasting along” without addressing the pent-up frustrations of an increasingly dissatisfied base. Trump has not only tapped into that simmering rage, but he’s masterfully stoked it and channeled it for personal gain, Barr said. What is confusing to Barr is why others aren’t doing everything in their power to reclaim control of the situation. “The genie isn’t out of the bottle yet. He has not clinched the nomination,” Barr said. While the reality TV star continues to rack up delegates with each primary, Barr maintains that the lead is neither insurmountable nor definitive. “There are still a lot of different scenarios left,” he said of possible roads to the GOP nomination. No stranger to bucking authority to prove a point, Barr has thrown his support behind presidential hopeful Sen. Ted Cruz, billing the freshman lawmaker as a refreshingly straight shooter. Barr, who sometimes clashed with his own leadership while on Capitol Hill, said he took a shine to the Texas Republican as soon as Cruz begun making waves in the Senate. The respect appears to be mutual; Cruz tapped Barr last fall to serve as chair of the “Liberty Leaders for Cruz” coalition. Playing campaign surrogate has not, however, impeded Barr from drawing his own conclusions about what needs to be done to keep our country in good working order. One of the things he is most certain about is that Senate Republicans need to stand tough on not taking up Merrick Garland or any other Supreme Court nominees that President Barack Obama might offer. “The country is not going to fall into the ocean if we don’t have a ninth justice for another year,” the former U.S. attorney said. Once the people have their say at the ballot box in November, Barr urged the next president to submit a Supreme Court pick in short order. “If it’s still Judge Garland, then there’ll be plenty of time to consider him at that point,” Barr opined. The marching orders don’t stop there. Barr implored sitting politicos to get to work on a number of outstanding priorities, ranging from deficit reduction (“Very much a live issue that needs to be addressed,” he counseled) to cracking down on invasions of privacy. He regrets various things left undone after 9/11, including plans to rein in national security letters (“Far too easy for the government to draft and implement,” he said) and limiting government surveillance in general. “The congressional leadership was just not supportive of a lot of those issues,” Barr shared, citing a reticence to undermine President George W. Bush’s rush to claim unprecedented access to once privately held information. Completing said mission is important to Barr. The question is: does it trump enjoying one’s retirement? Contact Rojas at warrenrojas@rollcall.com and follow him on Twitter at @WARojas Get breaking news alerts and more from Roll Call on your iPhone.